What appeared to be a communications problem that left Russian flight controllers in the dark about the status of a Soyuz capsule descending to Earth Sept. 16 was, in fact, no problem at all, simply the result of the spacecraft's trajectory and orientation, a crew member said Thursday. 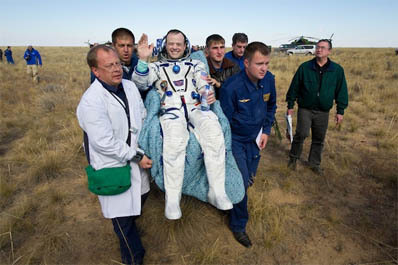 Ronald Garan, who returned to Earth aboard the Soyuz TMA-21 spacecraft after a five-and-a-half-month stay aboard the International Space Station, said the descent was normal and that he and his two crewmates did not realize until after landing that an extended communications blackout had raised concerns among reporters and other observers. "From what I understand, it was not unexpected," Garan told CBS News in a satellite interview. "Based on how south we were coming in, based on just the orbital mechanics of the re-entry, we expected some comm loss. On board, we didn't know there was an issue. We thought it was all just normal. So the first we heard there were some tense moments was after we got pulled from the capsule and we were talking to people on the ground. From our point of view, it seemed normal." The Soyuz spacecraft is made up of three modules that separate just before atmospheric entry. Garan, Soyuz commander Alexander Samokutyaev and outgoing space station commander Andrey Borisenko were strapped into the central descent module, the only component designed to return to Earth. Communications can be affected by a variety of factors, including re-entry heating, antenna location and the capsule's orientation. Just before module separation, Russian flight controllers lost communications with the spacecraft and the crew returned in an apparent radio blackout, with repeated calls from mission control near Moscow going unanswered. Recovery forces at the landing site in Kazakhstan regained communications just before touchdown, but mission control never did. 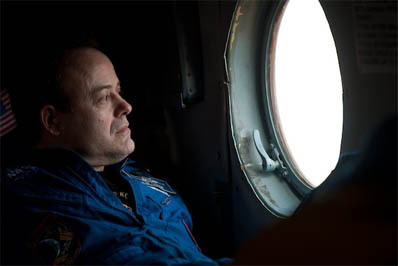 Describing the descent, Garan recalled an account provided by astronaut Scott Kelly, who returned to Earth aboard the Soyuz TMA-01M spacecraft in March. "He said as best he could tell, it was what he imagined it would be like to go over Niagara Falls in a barrel, but the barrel was on fire," Garan said. "That was my expectation going into it, and it did not disappoint me at all. It was a very dynamic, very wild ride. But it was actually a very fun ride, too. At one point, I let out an involuntary 'woo-hoo' and across the capsule I could hear Andrey saying it was like an American amusement park. "When the drogue chute opened, that was a very dynamic phase and that goes on for about 30 seconds, as if the three of us were on the end of a towel and it's just being whipped in every direction. And then that settles down and when the main chute opens, we go through those gyrations all over again. That was a lot of fun." Less than one second before touchdown, braking rockets in the base of the descent module fired to reduce the impact velocity. "Those rockets fire about six tenths of a second prior to impact and I felt and heard the rockets fire, so I knew we were about to hit the ground," Garan said. 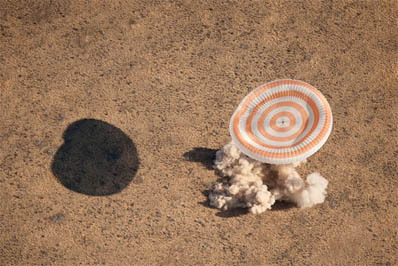 "As dynamic as the re-entry was, I think everything was about what I expected, except for the landing. The landing was significantly harder than I expected and I believe that we bounced. "I remember, we hit the ground and I said to myself, wow, that was really hard, I'm glad that's over. But little did I know, we had a couple of more landings to go because we had bounced in the air and then we had rolled over a few times. When we finally came to rest, we were on the side, I was on the bottom, and looking out my little window there I could see the dirt and the grass and I knew we were back on Earth." The departure of the Soyuz TMA-21 crew left the International Space Station in the hands of Expedition 29 commander Michael Fossum, Sergei Volkov and Satoshi Furukawa. Station managers had hoped to launch three replacements for Garan's crew late this month, but the Aug. 24 failure of a Soyuz rocket carrying an unmanned Progress supply ship disrupted the Russian launch schedule. Anton Shkaplerov, Anatoly Ivanishin and NASA flight engineer Dan Burbank now plan to take off aboard the Soyuz TMA-22 spacecraft Nov. 14. Fossum and his crewmates will return to Earth on Nov. 22 and three fresh crew members -- Oleg Kononenko, Andre Kuipers and NASA flight engineer Donald Pettit -- will launch around Dec. 21 to boost the station crew back to six. Garan said he is confident the Russians will resolve the third stage engine problem that derailed the Progress launch, describing the Soyuz launcher as a "very, very reliable, a very safe system." "But obviously, this caught us by surprise, the booster failure, it does have serious implications and so we hope it's just going to be a little bump in the road here and we'll get right through it," he said. NASA managers have said Fossum and his crew will come home on Nov. 22 regardless and if the next crew isn't on board by then, the station will have to be left unmanned, at least temporarily. Garan said he hopes it won't come to that. "We hope it doesn't lead to further delays and all the implications that would mean," he said. "But I think we're on a really good path to have the next crew launch on time, have a little bit of a handover between Mike Fossum's crew and Dan Burbank's crew, and we should be able to hit the ground running when those guys get up there."